8 tarns in one day! So pleased with myself. I met Dawn this morning in Hawkshead and we left her van at the YHA and drive mine a bit further down the side of Esthwaite Water. We set off along the road to find Out Dubs Tarn. There was a gate into the field but we couldn’t open the latch, so we had to climb over. This was a sign of things to come. The tarn is in a group of trees and as we got closer to them the ground stared to get pretty boggy. At the edge of the trees was the remains of a barbed wire fence which we had to carefully navigate. once over the fence we were into really marsh territory and as we got closer to the tarn we discovered that there was a very real danger at any given moment of sinking, without warning, up to the thigh in mud. We finally managed to get to a place we thought was close to the tarn and were faced with a wall of rushes, thick as anything and far taller than either of us. We left our bags and forged a path through the rushes, which were so thick that we couldn’t see the water at all until we were only a very few feet away from it. Scratched and battered we lowered ourselves into the water. Dawn thought she saw a leach as she was getting in which freaked us both out but we later decided it was a snail. 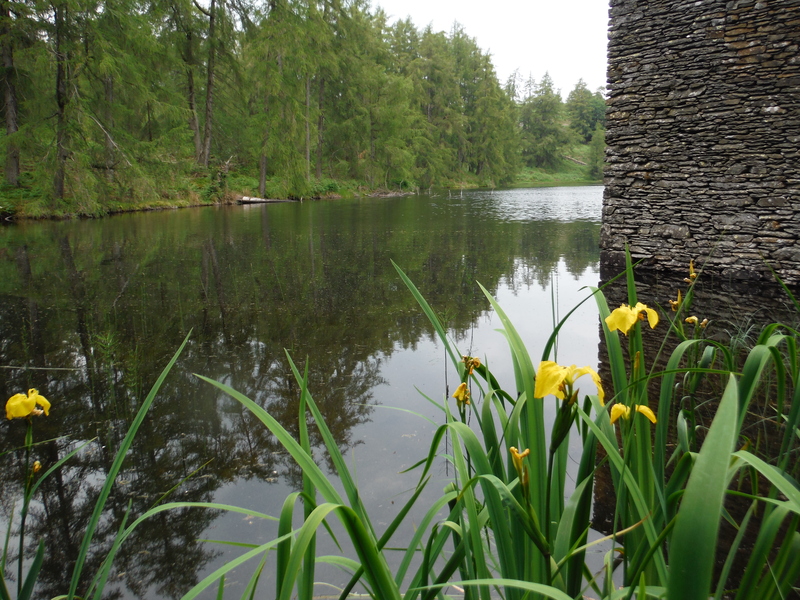 The tarn itself was lovely, surrounded by rushes with waterlilies in patches around it. There was an old boat at the edge resting in the rushes which we thought must have been left there in a pre-rush time. The water was so nice, especially on such a sunny day. 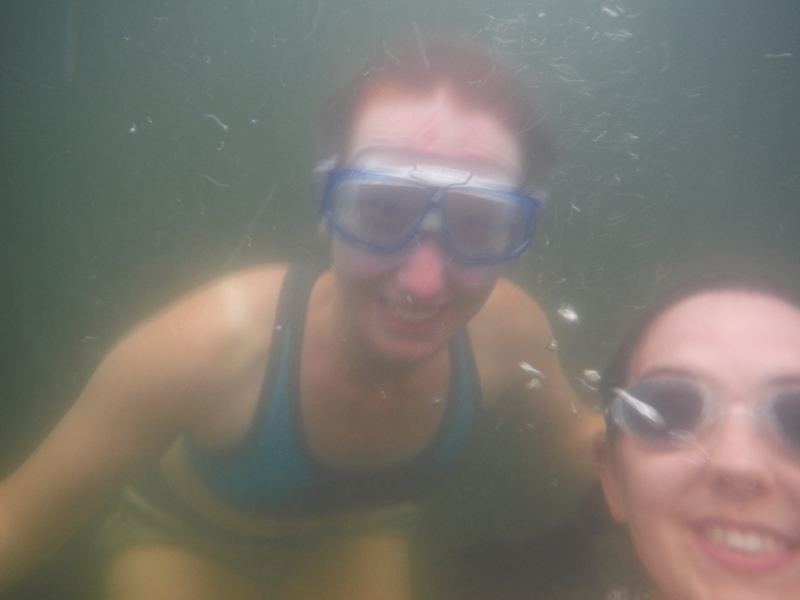 We did a circular swim, coming back to where our bags were and then had to do the whole approach again but backwards. The swim here was lovely, but between rush scratches, mud sinkings, leach scares and horse flies I’m not sure I’d do it again! 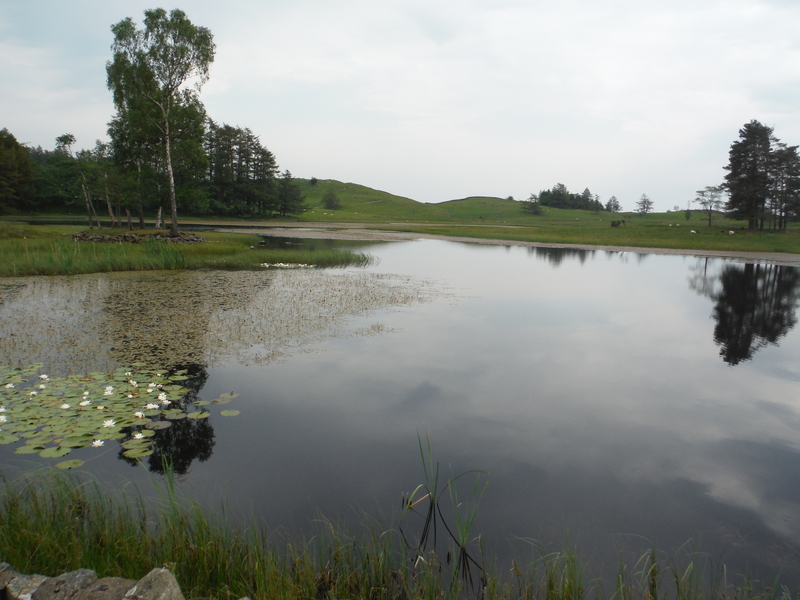 Once we’d battled our way back to the road we headed for Near Sawrey and then up the hill to Moss Eccles Tarn. 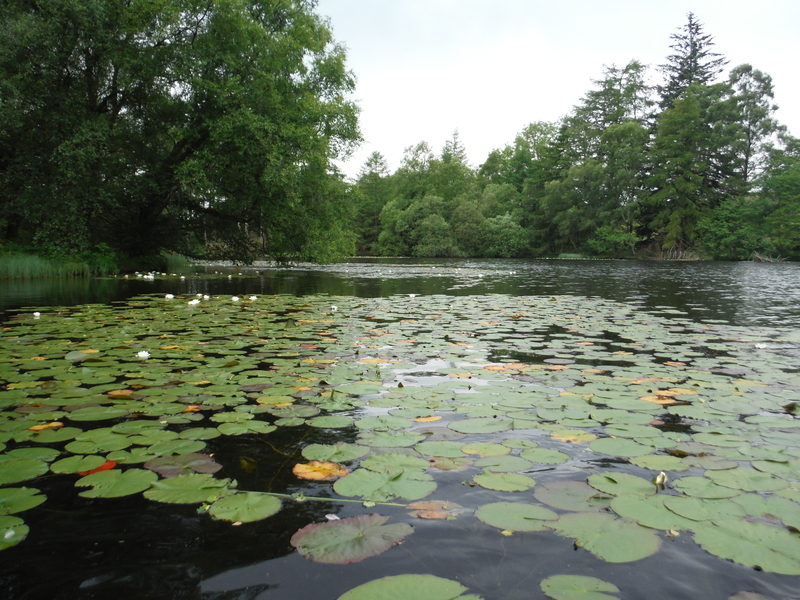 This was very different (ie you could see it before you got your feet wet) but still with the waterlilies and dragonflies that were very much a part of every tarn we swam in today. As we got in we stirred up the mud at the edge, releasing all the gas that had built up there. The resulting smell was also very much a feature of the day. 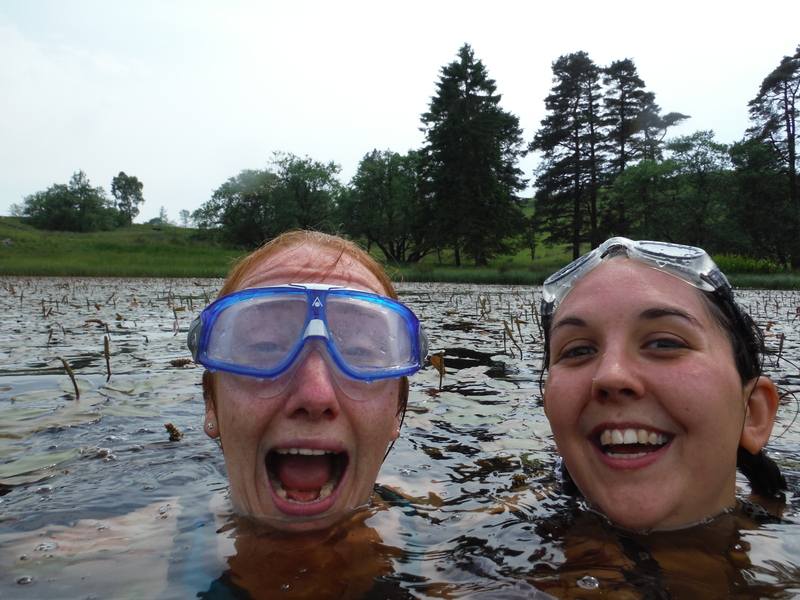 As we were swimming across Dawn spotted a woman taking a photo of us – 2 crazy women floating around in a tarn! Moss Eccles may well have been my favourite from today. 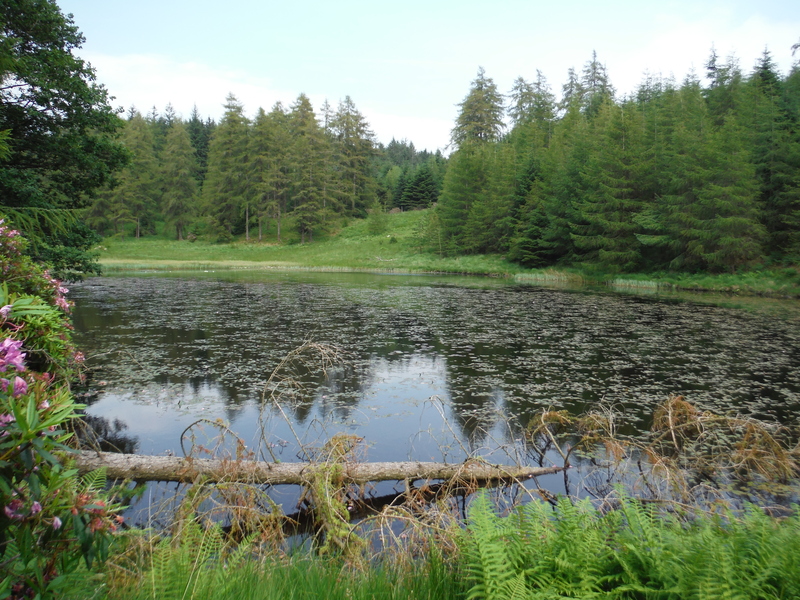 A lovely, peaceful spot and a nice tarn to swim in. After Moss Eccles we took a track that lead away from the main path towards Three Dubs Tarn. It felt very unused, as though no-one had been down it for a long time. It only really lead to the tarn, so probably not many people would have a reason to go down there. The grassy, overgrown track lead us through a silent pine wood, feeling like something out of a fairy tale. It really felt as if there was no one around for a long way. Until… as we got close to the tarn we saw a make-shift tent. And then, as we got closer… a lot more tents… a LOT more tents… and loads of people… We wondered at first whether we had stumbled upon a secret hippy commune, living in tents out in the woods, far from modern life… But it wasn’t. It was a course on expedition skills, which must have been very popular given how many people were there. We rather self-consciously made our way round to a dam at one end (having been advised by one of the not-hippies-after-all that the banks are an SSSI for dragonflies) and got in from there. 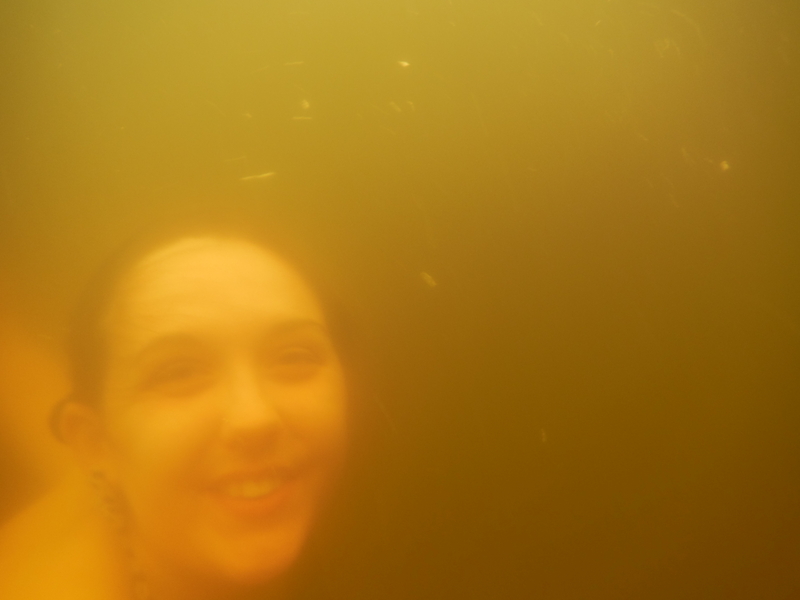 Another really nice swim in another small and shallow and therefore warm(ish) tarn. There is a boat house at the end of the tarn and we could see what looked like a deer skull with antlers sitting on the side. We heaved ourselves back out at the dam, smiled sheepishly at the expeditioners and headed back through the woods to the main path. Next along the way was Wise Een Tarn (what a great name). We left out bags at the side, walked round to a boat house at one corner and swam from there. This was Dawn’s favourite. Beautiful and tranquil, shallow enough to be warm and with the strange but somehow rather cute honking of an unknown bird somewhere in the reeds. 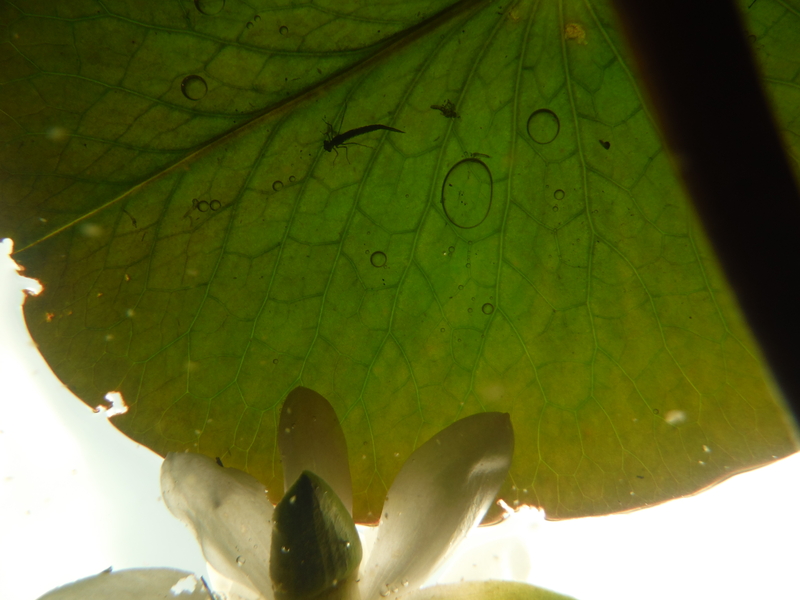 I tried to take some photos of the waterlilies looking up from below and when I got home found I’d got a picture of a little creature clinging to the underside of a leaf. 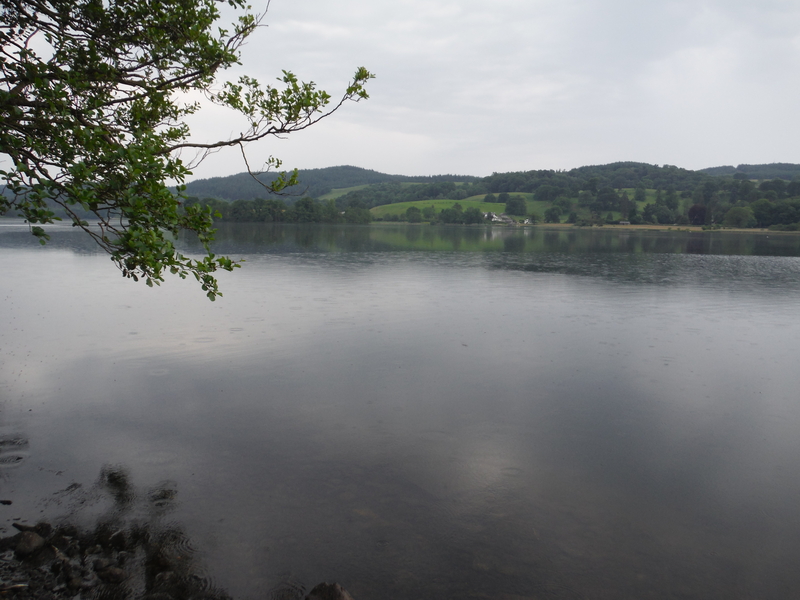 From here it was only a couple of minutes walk to Wraymires Tarn – by far the weediest tarn of the day. So weedy in fact that there was barely a space in the whole of the surface of the water. We had to battle our way through them, feeling the stems wrapping around our arms and legs at every stroke. 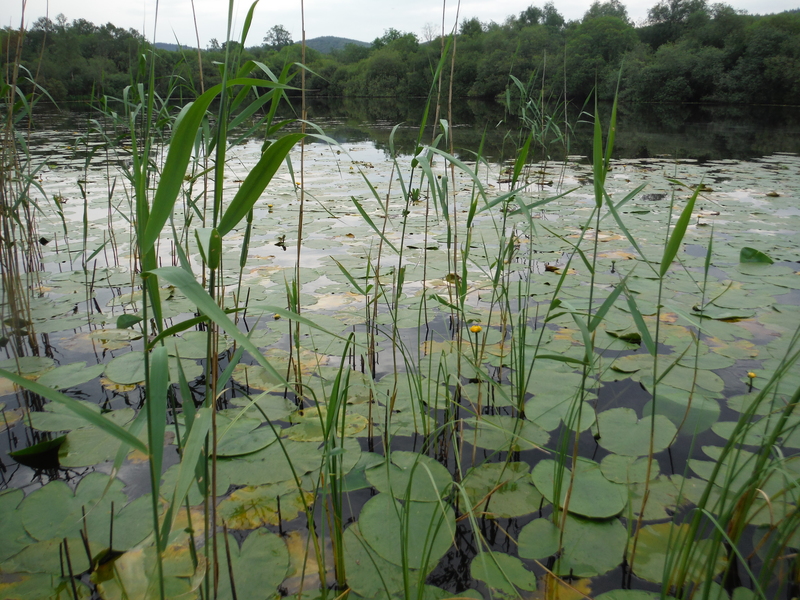 When we got out we looked back at the tarn and realised we’d left a trail through the weeds where we’d swum! 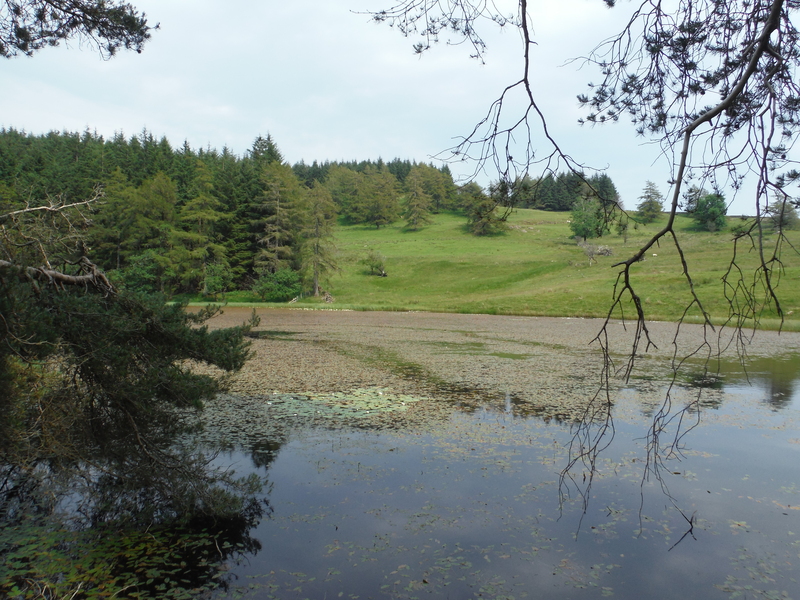 From here, on the map, there was a clear track to Robinson’s Tarn. From here, in reality, there was absolutely no sign of a track but an awful lot of bracken. So, both with tics on our minds, we brushed through it until we came to a stream that we could follow up to Robinson’s. 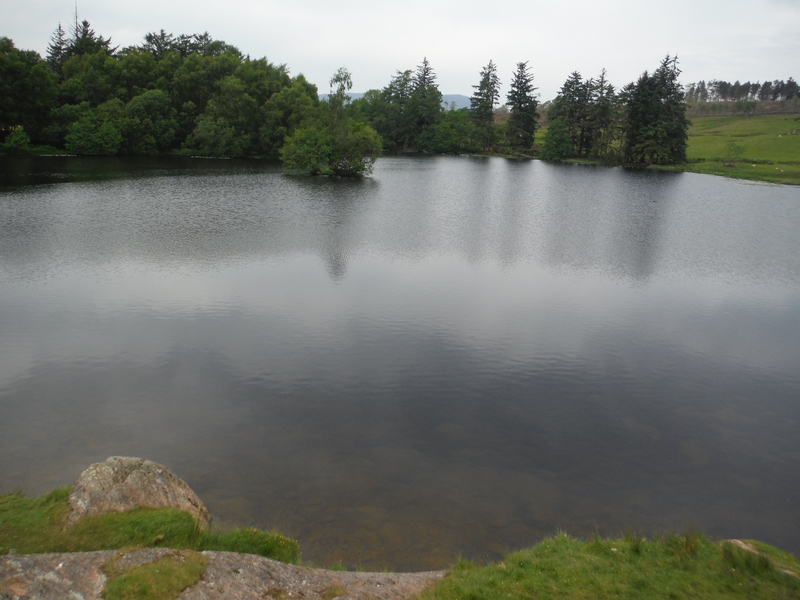 This was probably the most secluded of all the tarns we did today. It’s away from any path (now that the track leading to it is gone) and surrounded on three sides by trees. There was a completely broken down old boat house on the edge – every part of it lying flat on the floor – Dawn even put her foot through one of the walls trying to cross it. There had been another broken down boat house at Wraymires Tarn and the tracks that are marked on the map seem to lead to these boathouses as well as the one at Wise Een which, although it was still standing, also looked like it was no longer used. All the tarns were pretty weedy but maybe at one time they were clearer and it was obviously a popular area to go fishing. After Robinson’s we had to follow the stream again, as it was not even clear where the track had been when it did exist. We scrambled down it until we came to a track that did exist and then followed that down into Colthouse and back onto the main road. From the road we crossed a field to get to Priest Pot. This was also surrounded by rushes, but nowhere near as dense as the ones at Out Dub, and getting to the water was far easier! This was another contender for favourite of the day. Although it is not far from the road, Priest Pot is completely surrounded by trees, so you feel very closed in, as though you are in your own little world. 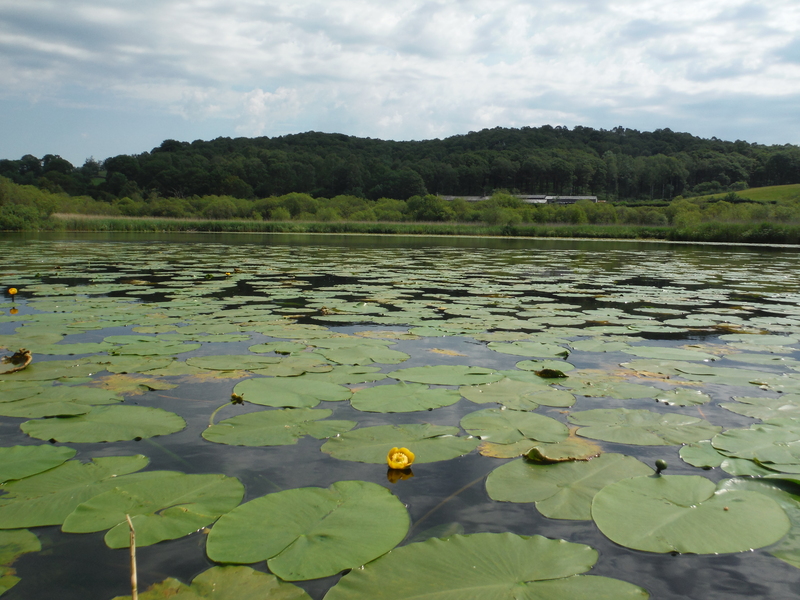 There were a few ducks and we even saw some tadpoles with legs – nearly frogs! From Priest Pot we walked along the road until we were nearly opposite the hostel and made our way down to the shore of Esthwaite Water. We left our bags under a tree and set of with only our car keys in the tow-float dry bag. This was a much longer swim than any of the others today, but it felt like a great way to end our rather epic adventure. 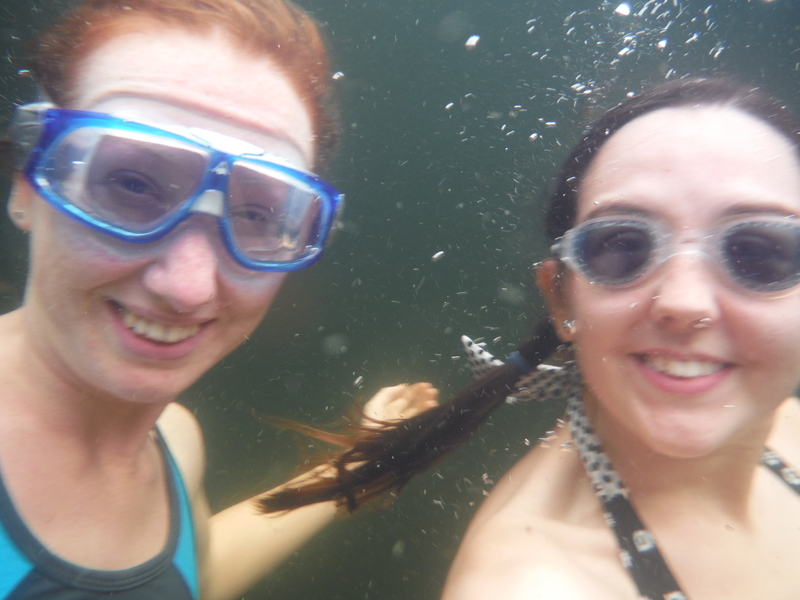 It started to rain as we swam across and it was fun to see the drops bouncing as they hit the water. As we got near to the other side we saw a huge flock of geese heading for the same spot as us and we were slightly worried about what they would do if we ended up in the same place, but luckily they stopped al little way off – that many geese is quite scary! We made it across without any goose attacks in just over half an hour. Dawn drove me back to my car (sitting on my dry bag) and I finally put on some dry clothes. I’d been wearing the same shorts and bikini all day, in the tarns and out, sometimes with a dry t-shirt over the top, which was fine as it was so warm, but it did feel nice to put dry clothes on! We drove back round to pick up our bags and then headed homewards. What a great day, so pleased to have done eight in one day! Thanks for coming with me Dawn, it was much more fun with two! I got told off in Esthwaite Water, apparently there’s no swimming. I should have gone to the spot you did and maybe I would have had a better experience.